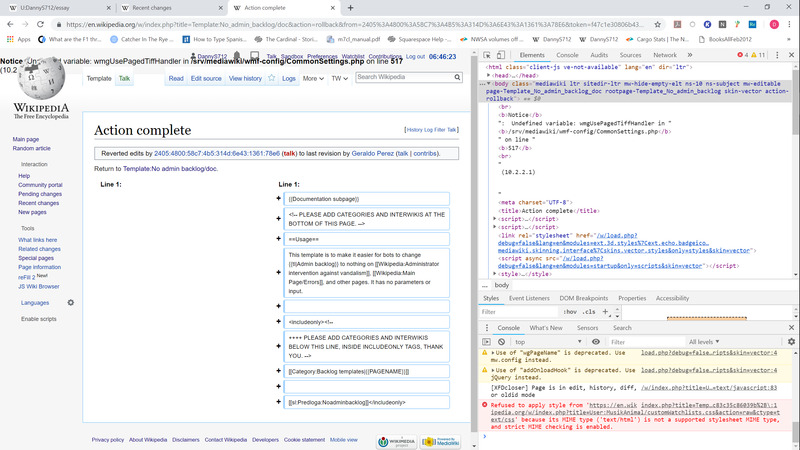 After performing this edit using rollback on the english wikipedia, I saw an error at the "Action complete" page (here). Screenshots of the page, and of the html that caused it to display, are attached. There were no errors in the console relevant to this. I believe it is related to https://github.com/wikimedia/operations-mediawiki-config/blob/master/wmf-config/CommonSettings.php#L517, since the error reports that $wmgUsePagedTiffHandler is undefined, and I can't find it mentioned previously in that file. 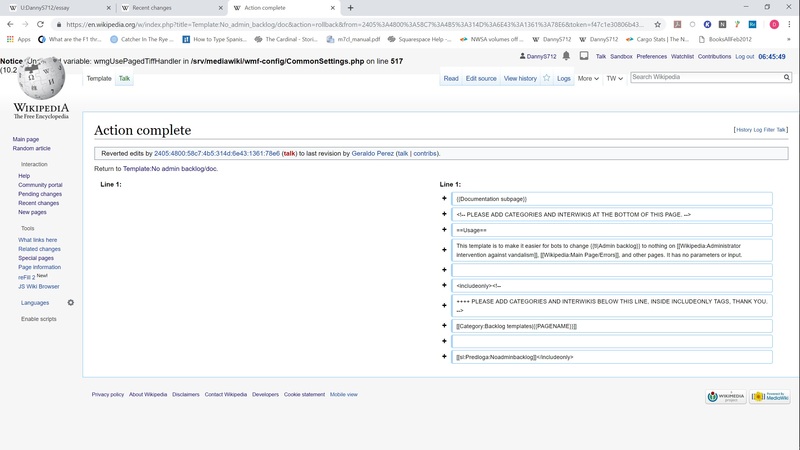 Aklapper added a project: MediaWiki-extensions-PagedTiffHandler. I can't find it mentioned previously in that file. @DannyS712 do you have the PHP 7 beta feature enabled? This error suggests that somehow (part of) InitialiseSettings' variables were not exported under PHP 7. That's very concerning. The code we use to cache and export these globals via a temporary file may need to be re-reviewed for this. In addition to potential PHP 7 compatibility, it's also possible we're seeing a pre-existing race condition where maybe different threads see a partially written file there or something else weird. Alternatively, if the setting of this variable works fine, it might be that something is un-setting it. But that seems rather unlikely (and code search suggests nothing else refers to this except the 1 line that sets it, and the 1 line that reads it). Krinkle added a parent task: T176370: Migrate to PHP 7 in WMF production. And know what was the end of these errors? Krinkle moved this task from Found during 1.33-wmf.21 to Resolved on the Wikimedia-production-error board. So while the errors found by @MaxSem on logstash seem to refer to a host that was somehow in a bad state in terms of opcache state, which will need further analysis, the other issue to fix is the display_errors ini setting, which used to be in our php configuration and I didn't modify. 2019-03-11T06:34:57 opcache received a request to invalidate a single file /opcache-free?file=wmf-config%2Fdb-eqiad.php, during a scap run. 2019-03-11T06:49:22 a full opcache flush was requested /opcache-free - not sure what caused this, but it came from scap. Now it seems clear to me that a full opcache flush repaired the issue, but the daemon has been restarted since so I lost any ability to further inspect what happened with its opcache. Grafana data don't show anything unusual either. So while an opcache flush did the trick of stopping the errors, there is no obvious issue at play here. Having opcache revalidation active every 60 seconds would've probably prevented this from happening. I'll solve the issue with display_errors and leave the bug open at lower priority so that we can relate it to other episodes of this happening.